Imagine school runs in the Nissan BladeGlider EV? Technologically, Nissan is hurtling forward at an alarming pace. Last night I stumbled upon an article of their new zero-emission three-seater Nissan BladeGlider EV prototype, which has just been unveiled in Rio de Janeiro. One of these days the school run will probably be done in these. Nissan is very serious about the development of new zero-emission vehicles and autonomous drive systems, and everything that goes along with that. The Nissan LEAF has been a great success story for Nissan, and is currently the world’s top-selling electric car. 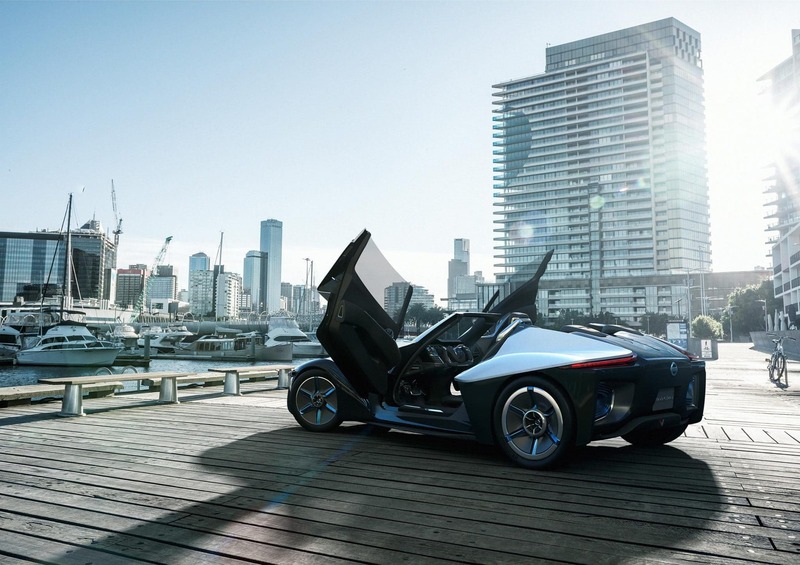 Staying with the foliage theme, the BladeGlider is Nissan’s ultimate electric fantasy, which would offer a fun, safe (and very aerodynamic) drive with sportscar-fast acceleration. Since the power is electrically available from the get-go, acceleration happens instantly. The roof of the Bladeglider is open, reinforced with an integrated roll-over protection structure, so it has the whole Coupé-look too. The interior of the Bladeglider gets my blood flowing. The central display shows everything from battery power to regeneration mode. This isn’t all that amazing, considering that this is found in most everyday hybrid cars. Take the Auris Hybrid, for example. But to make the Nissan BladeGlider EV have less drag, Nissan have done away with side mirrors, using two rear-view cameras mounted just behind the front wheels instead. The two screens on either side of the central screen display the images that the rear-view cameras see. Being fully electric, the Bladeglider is not fast as a 2017 Tesla Model S, but is sufficiently so. Its top speed is over 190 km / h and sprints to a 100 km / h in under 5 seconds. It is a rear-wheel drive car using two electric motors (130 kW each). One for each wheel. The design of this prototype is truly awe-inspiring. The BMW i8 is hot, but this is something else. There will be two Bladegliders in Rio in August. One will be for gawking at, the other for delighting members of the media and other important people..